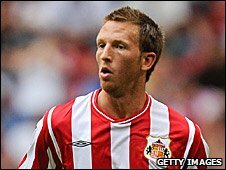 Sunderland defender Danny Collins is in talks over a potential move to Premier League rivals Stoke City. Collins, 29, has been captain of the Black Cats in their first two Premier League matches of the season. The Wales international travelled to Stoke on Friday and was on the bench for Saturday's clash between the sides, with a fee agreed for his transfer. "We have given Danny the opportunity to speak to Stoke. It is his call now," said Sunderland boss Steve Bruce. "He has been a wonderful servant to the club. We will leave it up to him over the next couple of days to see what he wants to do." Stoke signed Middlesbrough defender Robert Huth for £5m on Thursday, with a deal for Boro and Turkey striker finally completed on Friday. Tuncay and Germany international Huth trained with the Stoke squad for the first time on Friday, ahead of the home game against Sunderland. Prior to the signing of Huth, manager Tony Pulis had only managed to make one new addition, Sunderland midfielder Dean Whitehead for £3m.